Water is a natural resource that is absolutely necessary for all life forms on Earth. As population numbers increase, the important resource dwindles. The scarcity of water is not to be overlooked. It takes a natural phenomenon such as a drought to remind us to always be water-wise. The drought in the Western Cape persists and it seems we can no longer depend on their rainy season to make up for the lack of water. It’s time for us to be proactive and take responsibility where we can! 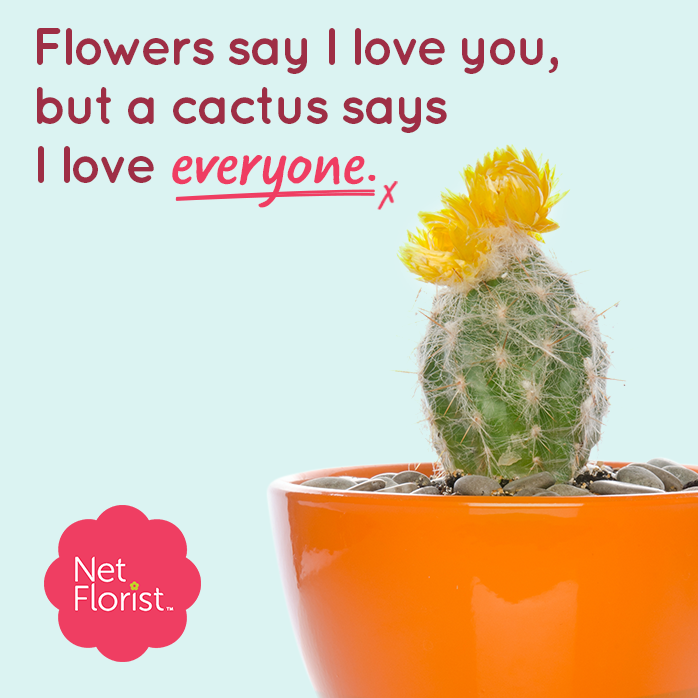 That is why NetFlorist has developed this particular Water Wise campaign. Send a cactus to someone special and we’ll donate R10 to drought relief projects in the Western Cape, proving you love more than one person. 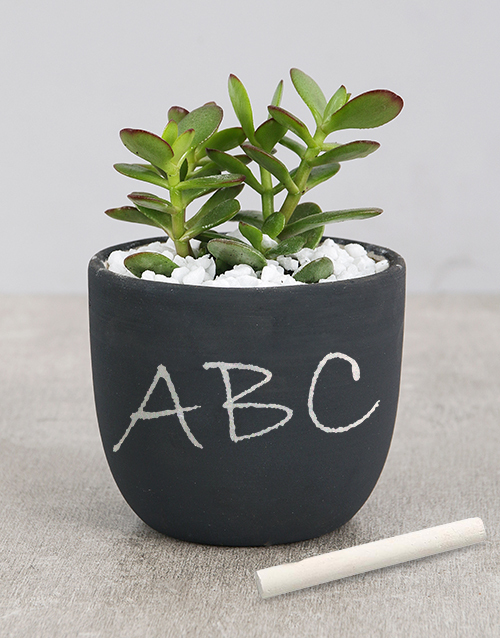 Spoil someone special with a sweet succulent which is displayed with white stones in a unique chalk pot which can be scribbled on with white chalk! This cute gift will certainly make an impact! 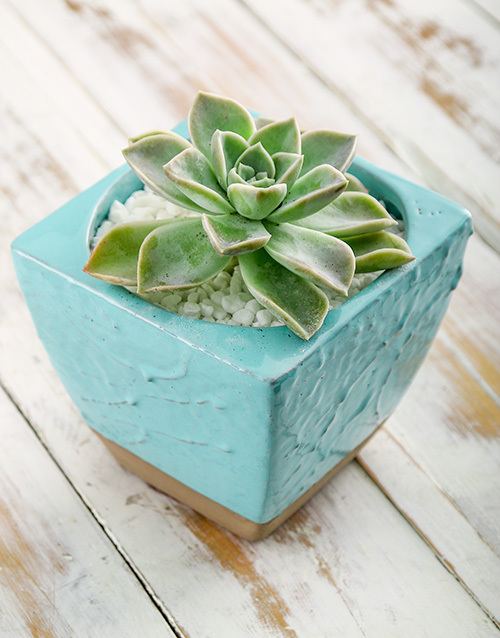 The perfect low maintenance gift for a friend or loved one, this small succulent in a blue ceramic glazed pot will look great sitting on their desk at home or at the office. 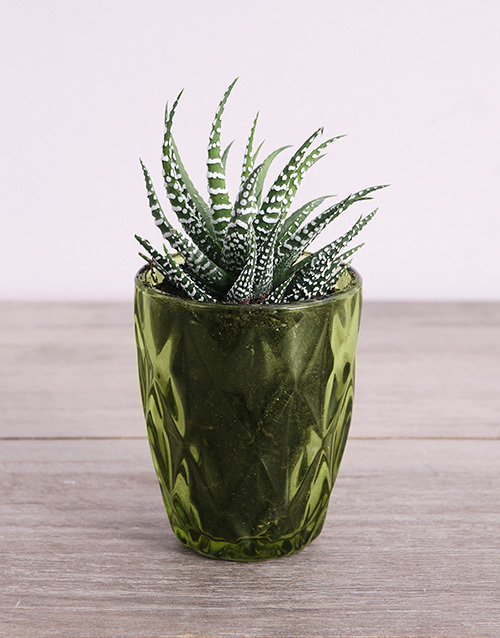 Send this cute little plant as a great gift with NetFlorist today! There are a number of stunning plants that require minimal water. Plant said plants after the first rains. This gives the plant the opportunity to create a strong root system just before it faces the dry season. Choose indigenous plants and shrubs. They are usually less ‘thirsty’ than alien vegetation. Check that are both locally occurring and hardy, non-thirsty plants. By grouping your plants according to their water needs, you avoid wasting water on plants that don’t need it. An irrigation system is best for watering your garden. They use controlled amounts of water, unlike a hosepipe. Another tip is to soak the ceramic pots instead of the actual plant. The ceramic retains moisture for longer and it seeps into the roots. Grass lawns are incredibly ‘thirsty’. Be sure not to cut your grass too short as longer leaves shade the roots and reduce water evaporation. Make sure you dig in plenty of compost at least once a year. This helps aid the water retention of the soil. It also adds nutrients, encourages earthworm activity, improves aeration and drainage. Organic mulch helps to reduce evaporation, run-off, erosion, suppresses weed growth, enriches the soil and it helps prevent compacting of the soil. The best formula for making organic mulch is by mixing shredded leaves, straw, compost, shredded newspaper and grass clippings. Save water by watering thoroughly but less often. Water when evaporation is at its lowest – in the early morning and late afternoon. A drip or underground irrigation also helps. Plant wind-resistant, fast-growing and water-wise trees and shrubs. Wind and the sun are both factors that can dry out plants. This one’s definitely a keeper! 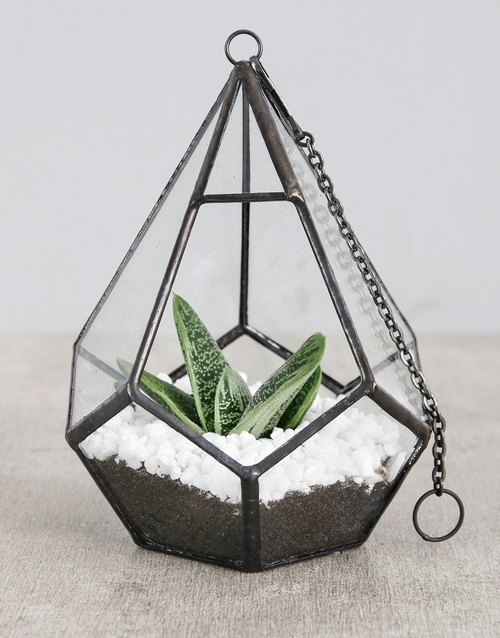 A mini cactus and succulent are displayed in a beautiful triangular geometric vase with loop chain, white stones and potting soil for that extra glam effect. 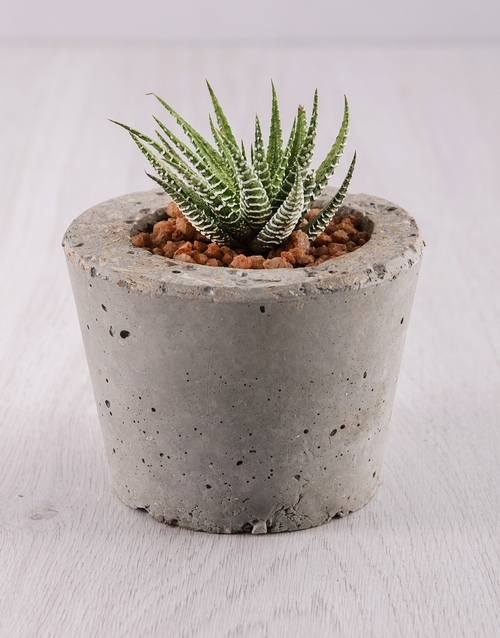 It’s the perfect gift for any plant-loving person! Spoil a loved one with either a gorgeous desert rose, a cactus, or a succulent which comes presented in a unique green glass votive. This is a gift that will look great displayed in any home or office, so send now! Join our campaign today and visit netflorist.co.za.